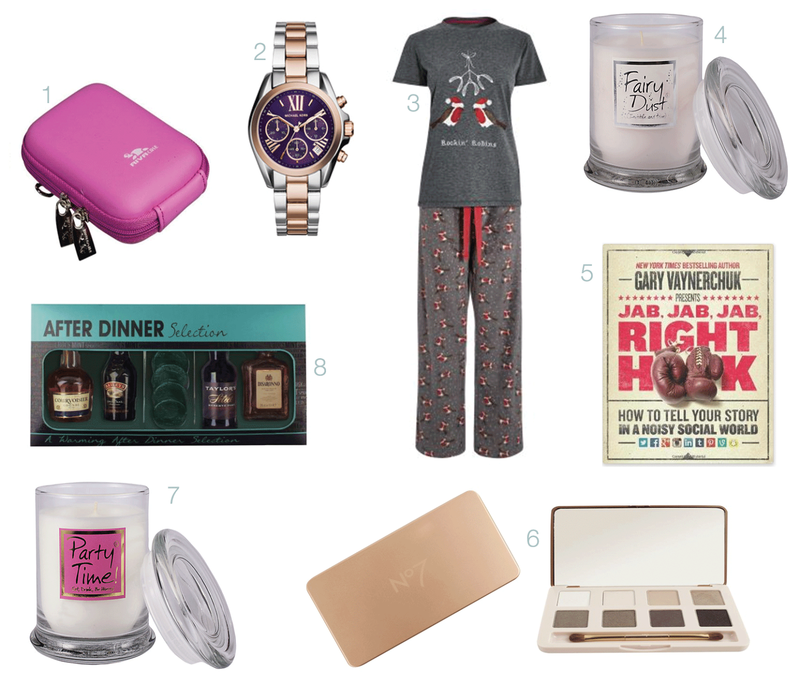 I have been loving all of the blog posts and YouTube video's lately of gift guides and wish lists so I thought I would put one together of the things I have on my list that I think any blogger or YouTuber would want on theirs too! 1. Riva Digital Compact Case - I have been using the white sleeve that came with my camera as my case *slap on the hand* so I think it is time to get a proper case to keep my camera safe when I am out blogging. My camera is the Canon IXUS 265 HS; if anyone was wondering. 2. Michael Kors Mini-Bradshaw Watch - Who doesn't want a Michael Kors watch? I have a leather strap one with a brown face and it was a present to myself when I started Uni but I have been getting slightly bored with it and want a link one now. I know this won't be under my tree on Christmas morning but isn't it so pretty? 3. Grey Cosy Robin Pyjamas - Christmas pyjamas or PJ's are a must for the month of December and really put me in the mood to chill out and watch Christmas movies all day. These grey ones are from Next and they have super soft bottoms with lots of Robins on wearing Santa hats and the top has the same Robins on but underneath some Mistletoe, one of the cutest things I have seen this year. 4. Fairy Dust Candle Jar - I recently have been wondering around John Lewis looking at their new Christmas range and this candle caught my eye. They have a lovely display of Lily-Flame candles and this smells so soft and perfectly warming for a cold December. 5. Jab, Jab, Jab, Right Hook - This is a book by Gary Vaynerchuk about using social media correctly, basically. I love getting new books at Christmas and after choosing social media as part of my research topic at Uni this book has made it to my list. If you don't know who Gary Vaynerchuk is then check him out on YouTube and you too will be hooked by his videos and his knowledge. 6. No7 Mini Eye Palette - No7 makeup brand by Boots has got to be one of my favourite brands this year. I have been using an eyeshadow palette by them for the past year and I am definitely in need of a new one! This one is perfect in a plastic case, with eight shades and has a handy mirror and double ended brush - what more could you ask for? 7. Party Time Candle Jar - This is another Lily-Flame candle from John Lewis that I have fallen in love with. I have never smelt anything like it but it smells like your bedroom after you have spent an hour getting ready to go out and you can smell that perfume you have on and the room smells sensual, soft and kind of musky. I am terrible at describing things but if you are near a John Lewis go in and smell this candle!! 8. After Dinner Drinks Selection - Who else loves a little after dinner drink at Christmas or throughout the New Year? This can be bought at Boots and features 4 small bottles and 4 mint chocolates. All bottles are 50ml and there is; 1x Cognac, 1x Port, 1x Irish Cream and 1x Amaretto. This is definitely something I would enjoy whilst watching Christmas movies or reading a Christmas book. I have been hinting for a few things to Jensen and my sister and mum so hopefully they might see this and know exactly what is on my list! You've made some nice choices! I really like that Pj set it looks so cosy! I love nothing more then being in mine on a winters evening. I bet those candles smell amazing! I'm curious to know what Fairy Dust smells like.